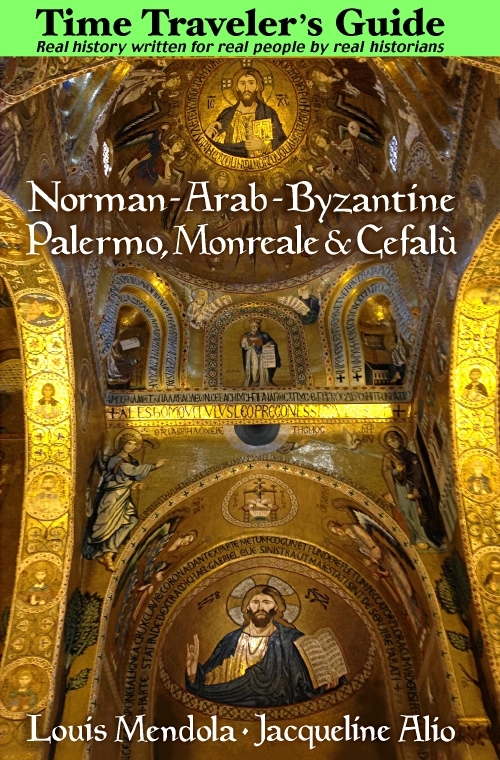 Palatine Chapel and Norman Palace of Palermo - See Palermo and Western Sicily. Once in a while we encounter a small but geographically prominent place which bears the mark of having been a seat of some kind of power for millennia. Palermo's Norman Palace, which includes the Palatine Chapel, is one such place. Cities need founders, and if Palermo lacks a Romulus and Remus it can claim equal antiquity to Rome. Neither was built in a day. The site where the Norman Palace now stands was fortified with heavy stone walls by the Phoenicians, who founded it as a trading colony sometime before 700 BC (BCE), coinciding with the Greeks' colonisation of eastern Sicily. The Phoenicians' descendants, the Carthaginians, returned three centuries later to develop and fortify their city of Zis into what later became known successively as Panormos, Panormus, Bal'harm and Palermo. To the Greeks the port city was an irritating reminder of Carthaginian power in western Sicily and a springboard for Punic attacks on Greek cities such as Himera to the east. Zis, of course, was not the only such annoyance; there were also Motya and Kfra (or Solus or Soluntum), the latter of which fell to Greek power in 396 BC. Following the fall of Greek Sicily to Rome, the rulers of the emerging Empire simply couldn't tolerate a competing power in the central and western Mediterranean, hence the Punic Wars, with Punic Palermo as one of their main battlegrounds. The Romans had, in a sense, inherited the Greeks' complex power struggle against the Carthaginians. Carthage fell, followed by Rome. The Visigoths discovered Panormus but didn't stay long. For the Byzantine Greeks Palermo, and therefore the high point of the city built around what is now the Norman Palace, never warranted so much attention as Syracuse on the Ionian coast. In the meantime the shoreline receded and the population dwindled, to be restored by the Arabs in the ninth century. They build the emir's large citadel, al Kasr, over the walls of the Carthaginians' fortress overlooking the Kemonia River nearby, and expanded their new metropolis in every direction, erecting administrative buildings in the district claimed from the sea, al Khalesa (today's Kalsa). Until the unification of Italy in 1861, the street now called "Corso Vittorio Emanuele" (for the new monarch) was, in fact, called "Via Cassaro." This district, like the Kalsa, was known by the Italianised version of its Arabic name. Sicily's Aghlabid emirs (a Tunisian dynasty) ruled by authority of the Fatimids, their suzerains until 948. Under the Aghlabids' successors, the local Khalbids, the unified Emirate of Sicily, such as it was, divided several times, though Bal'harm (Palermo) remained the island's nominal capital and most important city. The cooperation of rival emirs with the invading Normans rendered a difficult conquest less difficult. With the arrival, in 1071, of Robert Guiscard and his younger brother, Roger, the stage was set for Palermo to assume its rightful place as a European capital. Al Kasr became the fortress of Palermo's --and Sicily's-- rulers. It was restructured around four large towers: the Pisan, Greek, Kirimbi and Joaria. Almost everybody who comes to the Norman Palace comes to see the Palatine Chapel, but there's much more to see. Apart from the Palatine Chapel, the structure's main attractions (most are open to the public most of the time) are the Punic (Phoenician-Carthaginian) archeological site, the "crypt chapel" with the "donjon" passages nearby, Roger's Salon, the astronomical observatory and the various Baroque rooms throughout the palace. From outside the visitors' entrance, a few pointed battlements have been preserved, but most of these crenels are relatively recent modifications. Originally there were battlements in some parts of the palace. Most of its medieval walls, both inside and out, are now obscured by the less attractive additions of subsequent times, but the Pisan Tower of the Normans' Royal Palace looks much as it did nine centuries ago, at least from the outside. Don't judge it from outside, for if its exterior is less than impressive, the palace's interior still evokes much of its former grandeur. The Royal Palace now houses the Sicilian Regional Assembly,the parliament of Italy's largest semi-autonomous "regional" government. Roger II ordered the palace's enlargement sometime before 1132, though the existing structure already included the simple chapel (now the "crypt") near ground level. It was actually a castle in the most traditional sense, complete with a garrison (the royal bodyguard), victual stores and armory --though with a lavishness of design rare in western Europe in the twelfth century. Recently restored, the ceiling has some interesting images, and even Arabic script. Lions and eagles are prominent. One of the more remarkable images shows chess being played --an indication of the intellectual activities of the medieval Palermitans. Dancing is also depicted. Islamic practice generally discouraged the artistic representation of humans in portraiture, but these paintings in tempera, part of what is widely considered the largest single Fatimid work of art of its day, seems to reflect the relaxed norms of a tolerant society. Though the architectural construction of the chapel was probably completed by 1140, the artistic phase certainly required several more years. The ceiling is the work of local and Tunisian artists. 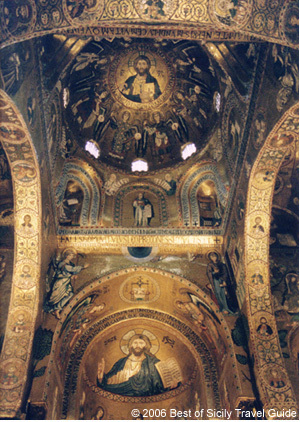 The mosaics --many representing Biblical scenes-- were created by Orthodox monks from Sicily, mainland Italy and Greece (and as far away as Constantinople), the same artists who worked on the Martorana. The stone inlay of the floor and lower walls is also a very demanding craft requiring much skill and effort. The Old Testament scenes of the nave walls (there are none from the New Testament although apostles and angels are represented on other walls) offered the advantage of appealing to Christian, Jew and Muslim alike. An explanation of the Biblical scenes (keyed to the back and white diagram below) follows at the end of this page. On the wall behind the throne platform is the coat of arms of Aragon added some time after the Sicilian Vespers war of 1282 when that dynasty began its reign in Sicily. The mosaics outside the chapel are modern additions. It is not known whether the Hautevilles ever used as their coat of arms a red and white checkered bend on a blue field. The "Sala di Ruggero" is one of several rooms in the palace which exist in something close to their original condition. This one has mosaics, some of which doubtless represent animals in the Genoard park, while others are clearly symbolic. The pairing of animals, sometimes as mirror images, is typical of Byzantine iconography, even if none of these images are explicitly religious. This part of the royal apartments probably was a place for dining or entertaining. Despite what you may read, Roger II and his grandson, Frederick II, did not keep harems in a formal way; officially there were beautiful, young, single women resident in the palace whose principal occupation was weaving and who were not part of the court, but who occasionally performed other duties as well. This modern addition to the Pisan tower is essentially a museum of nineteenth-century telescopes and other instruments used in the earth sciences. The first large asteroid was discovered through observations here in 1801. The original "palatine chapel" was this one, located in a quiet and secure area just below ground level, constructed late in the eleventh century. (This is not actually a crypt.) It predates the construction of the upper levels of the castle's superstructure and towers. A mosaic fresco on display has been preserved from this early period. Parts of the surrounding corridors and rooms (the donjon) date from before the arrival of the Normans. This is the oldest surviving part of al Kasr readily visible to us today, other walls having been destroyed, built upon or incorporated into more recent rooms. Entry is through the Montalto room. While it's not nearly so extensive as the Punic walls at Erice or Mozia, this site is one of the oldest of its kind preserved in Palermo. It cannot be dated precisely, being either Phoenician (circa 700 BC) or Carthaginian (400 BC). Precisely cut and constructed, it is similar to other Phoenician structures around the Mediterranean. In common parlance the term "Punic" describes both cultures. 1) Creation of light and sea, 2) Separation of land from oceans, 3) Plants created, 4) Heavens created, 5) Fish and birds created, 6) Land animals created, 7) God creates Adam, 8) God rests, 9) God gives Tree of Knowledge to Adam, 10) God creates Eve, 11) Forbidden fruit, 12) Adam and Eve ashamed, 13) Expulsion from Paradise, 14) Adam and Eve toiling, 15) Cain and Abel, 16) Abel killed by Cain, 17) Confession of Lamech, 18) Enoch assumed into Heaven, 19) Noah and his family, 20) Noah's ark constructed, A) The dove returns, B) Noah leaves the ark, C) Noah plants vines, D) Construction of Babel, E) Abraham greets 3 angels, F) Lot resists Sodomites, G) Sodom destroyed, H) Abraham about to sacrifice Isaac, I) Rebecca, J) Isaac blesses Jacob, K) Jacob's ladder, L) Jacob wrestles angel, M) St Andrew, N) St Paul, O) Christ Pantokrator (ruler of all). Print the key to the Palatine Chapel's Biblical scenes.